of OTR tires wear out prematurely, attention to tire management strategies is crucial for cost containment. For certain types of equipment in a typical mine production fleet, tires are the principal, and often the only connection between the machine and the dirt, providing the sole means to steer and stop the vehicle and carry payloads in an efficient manner. That means there’s a lot riding on the massive rubber, synthetic fabric and steel doughnuts found on the four corners of haul trucks and loaders, ranging from operator safety and comfort to production efficiency and overall vehicle operating expense. And when supply shortages impact the industry as forcefully as they did in the early 2000s, tires can become a budget buster. Fortunately, the global mining industry has been riding a modest wave of stability recently, and based on comments from major tire company executives at the Tire Industry Association OTR conference held in February, the industry isn’t currently plagued by widespread tire shortages. Fleet operators can generally get the sizes, models and quantities they need, with scattered regional scarcities attributed mostly to logistics or distribution problems. Executives from several major suppliers noted at the conference they had plans to expand production for OTR units in 2018 and beyond and introduce new models to fill product-line gaps in both surface and underground applications. These future products will join the handful of new offerings introduced by major suppliers in the past year or two, such as Bridgestone’s VREV (V-Steel Rock Extra V-Operation), which features buttress fins, shoulder grooves and parallelogram tread blocks that are claimed to deliver improvements of up to 7% in wear resistance and 10% in heat resistance; BKT’s Earthmax SR 42, developed for cold-weather use on haul trains in mining and featuring a specially engineered tread compound to provide particular resistance against cuts and wear, and to ensure safety at extremely low temperatures; Michelin’s X Mine D2 Pro and the XSM D2+ Pro Line underground mining tires, with an increased load capacity of up to 18%; and Yokohama Tire’s RB42 33.00R51 E-4 radial tire for rigid frame haul truck applications, now available in multiple compounds — CP (cut protected) and REG (regular). Suppliers are also addressing regional service, distribution and product demands. In late 2017, for example, Bridgestone announced it had established PT. Bridgestone Mining Solutions Indonesia (BMSI). The new entity integrates Bridgestone’s Jakarta, Indonesia, representative’s office, which provides mine-tire maintenance services, with PT. Bridgestone Engineered Products Indonesia (BSEA-IN). Bridgestone said BMSI will function as a regional company similar to Bridgestone Mining Solutions Australia Pty Ltd., which started operations in Australia on January 1. Double Coin Tires, a brand of China Manufacturers Alliance LLC, announced in April its California warehouse received the first shipment of OTR tires from its plant in Thailand, built to support the brand’s North American market sales. 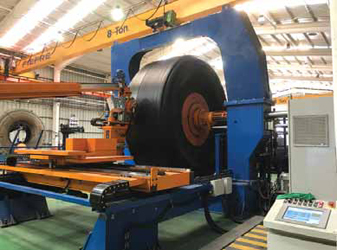 Elsewhere, Canada-based Kal Tire’s Mining Tire Group, a tire service provider and major retreader that operates on five continents, recently expanded its presence in Mexico’s mining industry, building a state-of-the-art retread plant based on high expectations for demand from that country’s resource sector. OTR tire suppliers, in addition to seeking new avenues for market expansion, are also widening their technological horizons. Jennifer Jensen, associate editor, reported that OTR tire manufacturer Balkrishna Industries Ltd. (BKT) recently celebrated the first decade of its Earthmax tire lineup, and announced plans to achieve a 10% market share — up from its current claimed 6% share — in the all-steel radial segment of the global offthe- road (OTR) market by 2025. BKT first launched Earthmax tires for loaders in 2018, currently has a range of 25 all-steel radial OTR tires and plans to add even more, all produced at its Bhuj plant in India. Dilip Vaidya, BKT’s president and director of technology, said 51- in. tires will be released to the market in the second quarter of 2019, and 57 in. following in the second quarter of 2020. BKT has entered into a joint research agreement with Kultevat Inc., a U.S. biotechnology company that specializes in the cultivation of a specific variety of dandelion plants (referred to as TKS dandelion) as a renewable and sustainable industrial alternative to natural rubber. “We will develop new compounding methods to be integrated in the tire manufacturing process, and TKS rubber will gradually replace the use of natural rubber,” Vaidya said. BKT also is focusing on the use of nanomaterials or nanocomposites, which can provide enhanced performance, according to Vaidya. In this area, they have studied the use of graphene, which is wear and puncture resistant. In addition to those technologies, BKT has set up its own carbon black manufacturing plant at the Bhuj plant site and will begin production in the first quarter of 2019. As a carbon black manufacturer, BKT will be able to produce customized carbon black in non-ASTM grades that are unavailable in the market, Vaidya explained. 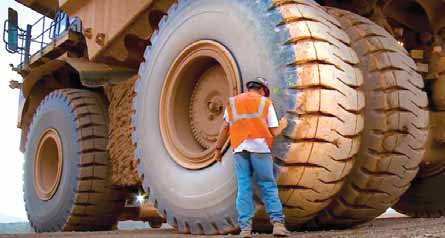 Despite their high-strength components and robust design features, keeping the giant OTR tires found on haulage and loading vehicles healthy and long-lived generally requires frequent inspection, proper maintenance and accurate recordkeeping, a recipe made to order for technological assistance in eliminating human error and conserving workforce resources. It’s also an area with a rapidly expanding vocabulary; joining the standard conversational topics of load capacity, durability, puncture/cut protection and rolling resistance are newer concepts such as “holistic solutions,” “predictive analytics” and “embedded technologies.” Tech-savvy mine operators are becoming increasingly interested in making better use of the massive amounts of operational and historical data collected from their production fleets, and major OTR tire manufacturers are offering new solutions to meet customer expectations. On a broader scale, end users seem to be moving away from a trans-action-centric approach, which focuses mostly on tire purchase price and instead, are looking at total cost of ownership. That’s where tire management systems can make a significant contribution to improved profitability, according to Rob Seibert, director of marketing, commercial OTR, Bridgestone Americas Tire Operations. In an interview with E&MJ, he sketched out the overall scenario Bridgestone recommends for getting the most value, in terms of cost per mile, through correct tire selection and management. “There are three principal areas that we look at when helping a customer pick the right tire,” Seibert explained. “First is the initial selection stage, where we work with them to understand site requirements and conditions such as haul speed, payloads, haul distances and road conditions. with a tire preventative-maintenance program and software, such as the company’s TreadStat system. Haul Road Condition Monitoring – “After the tire has been properly designed, engineered, correctly selected and mounted, it has to go to work. That’s when you need graders on the haul roads, dozers working to clean up the dump areas, and payloads that keep spillage to a minimum. “If you’re doing this, along with the other four factors I’ve mentioned, it’s likely you’re running a world-class tire management program,” he concluded. Seibert noted that Bridgestone has seen a trend in its giant OTR customer base toward using its B-TAG system as a tool to improve haulage productivity in relation to tire Ton-Mile/Kilometer-Per-Hour (TMPH/TKPH) ratings listed by tire manufacturers. TMPH is an engineering calculation, which varies somewhat among manufacturers but is based on load carrying capacity in relation to heat generation, assuming average operating conditions. It’s a number that is not to be exceeded without risk of forfeiting tire warranties. Bridgestone has offered its B-TAG tire monitoring system to giant-tire end users for several years, and recently introduced PressureStat, which supplements B-TAG and extends tire inflation monitoring capabilities to underground mining, quarrying and industrial applications that use other types of OTR tires. B-TAG hardware installed on the vehicle sends data from sensors in the tire to an onboard system, from where it can be forwarded to the mine dispatch system, a B-TAG handheld reader or downloaded directly for analysis. Mine operators not only can see data in real time to make immediate decisions, but data can also be compiled to identify pressure trends or assess and adjust operating conditions for more long-term solutions. • Streamlined forecasting and analysis when combined with TreadStat, allowing users to report on the condition of tires and rims from any device anywhere in the world. Johni Francis, global OTR product manager at Titan International, told E&MJ he sees a fairly wide spectrum of customer preferences when it comes to tire selection; some are interested only in the purchase cost, others focus closely on cost per hour, and tire selection is generally a case-by-case process based on site conditions and operational necessities. He has noticed a definite competitive advantage among mine operators that have learned how to employ available technology to maximize tire and rim uptime. “The customers that are using tire pressure monitoring, tire tracking and other related applications know exactly what’s happening across the site at any given time. If they spot a tire-related problem such as underinflation or excessive heat buildup, they can act to solve it before it affects production,” Francis explained. Francis said Titan has developed two major innovations in tire and rim technology. The company’s LSW (Low Sidewall) design provides improved stability and performance in loader applications. LSW tires feature a larger rim diameter and smaller sidewall than conventional tires, which reduces swaying and bouncing of the machine, resulting in less material spillage and operator discomfort. Titan also introduced three new sizes to its Accelerated Change Technology (ACT) wheel line, a wheel concept that the company said has been proven to reduce downtime associated with tire changes and rotations by up to 50%. The ACT design eliminates the need for the outside wheel to be removed when changing the inner tire. All the bolts stay on and there’s no need to torque the wheel — whereas a standard wheel requires removing both the inner and outer wheels and re-torqueing. The ACT wheel is now available in 33-, 35-, and 49-in. versions featuring single-piece lock rings, in addition to 51-, 57- and 63-in. sizes. Titan said ACT wheels are designed to fit nearly any rigid framed dump truck and are compatible with any brand of OTR tire. The topic of OTR wheel care often is overshadowed by concerns about tire maintenance and repair, but proper wheel maintenance can contribute appreciably to tire longevity. One of the most common problems that can affect both wheel and tire health is the presence of moisture, which not only corrodes steel wheels, but also reacts with rubber, according to OTR wheel manufacturer Rimex. Wheel corrosion leads to rough surfaces and tire beads that don’t seal properly, Rimex explained in a recent online blog post. Exposure to oxygen also ages the inner liner — the thin layer of rubber inside the tire whose function is to keep air away from the carcass. As the inner liner ages, more and more air passes through it, leading to pressure losses that can average 2 psi per month in truck tires. As it passes through the rubber, the oxygen can also corrode and rust the steel cords. • Pooled water in tires that isn’t sufficiently removed before installation. It is impossible to get all the water out of a tire using a bucket, so some sites use a vacuum system. • Wet rims and components. Moisture accumulates on components when they sit out in the elements, unprotected, or when they are cleaned with a hose prior to mounting. • Moisture buildup in inflation hoses. Water traps should be used on compressors, and at inflation stations, to remove as much water as possible before the air enters the tire chamber. • Steam generated by the moisture and heat of operation. Exposure to steam magnifies corrosion. • Moist or wet storage areas. Always store rims and wheels in dry environments. An effective way to stop wheel and rim corrosion, according to Rimex, is to add a corrosion inhibitor to the tire, prior to mounting. Corrosion inhibitors are coatings that are applied to the inside of the tire casing as part of the tire-mounting process, either by the maintenance shop or by a tire service provider. In general, inhibitors are composed of fibers and/or fillers in a viscous liquid suspension. Fibers may be textile filaments or other material. Fillers can include small particles of crushed rubber or plastics. An inhibitor’s performance depends on its compounding properties, and each supplier creates specific formulations for particular applications. Rimex offers a premium rust inhibitor called Rimexcel. Kal Tire’s Mining Tire Group is following an ambitious set of initiatives related to regional OTR tire repair and retreading, reports Oscar Martinez, E&MJ’s Latin American editor. The company’s efforts are directed at helping its mine-operator customers hold tire-related costs to a minimum, while achieving higher availability. With cutting-edge tire retreading plants located in prime Latin American mining locations, such as Chile and Mexico, Kal Tire said it can bring significant benefits to local miners in terms of extended tire life and higher productivity. E&MJ visited Kal Tire’s site offices at La Negra, an industrial complex in Antofagasta, Chile, to interview Mining Tire Group Senior Vice President Dan Allan. “We have been in Chile for at least 20 years, so we’ve had a long time to invest here and to understand the market and feel if there’s a future for us. What you’ve got in Chile is a unique package of world-class mining companies and world-class ore deposits, so we felt that would be a testament for Kal Tire to succeed here,” Allan said. The company’s service portfolio available to its Latin America customers includes its Tire and Operations Management System (TOMS), a proprietary tire-tracking system introduced in 2016 that records tire status and historical data and measures performance of tire management teams. Information entered into the system allows these teams to conduct advance planning while keeping mine operators informed of possible tire-related needs. Haul trucks requiring tire service, for example, can be scheduled for shop time with minimal impact on production. Kal Tire also offers tire pressure data monitoring through its TPMS system, which updates every 30 seconds, with different configurations including the option to use Wi-Fi, cellular or radio network communications. The company’s La Negra plant was built in 2015 and was the first retreading facility to service mines in the region. The plant is now at full capacity, and Kal Tire is currently building an even larger plant in Mexico. Each new plant includes the latest technology and as improvements are found, they roll those into existing facilities, said Carlos Zúñiga, general manager, Kal Tire Antofagasta. “Retreading a tire is nothing new. What makes it interesting is the size of the tires and expected quality performance in terms of tire life and safety,” Zuñiga said. As an example, he noted that a set of 57-in. tires were retreaded at the plant in November 2017 for a fleet of loaders and are still in service today. Overall, Kal Tire expects it can reduce tire costs for wheel loaders by 10-20% through the use of high-quality retreads. The retreading process, according to the company, does not affect the tire casing. The tire keeps the same characteristics in term of load capacity and air pressure. Retread customers receive a guarantee similar to those accompanying new tires. In line with Chilean regulations based on the global Extended Producer Responsibility (EPR) environmental strategy, Kal Tire also is installing a world-class tire recycling facility adjacent to the La Negra retreading plant, and it is expected to be fully operational by the end of 2018.